All Wisconsin bird lovers! You do not need to be a WSO member to attend. By mail. Download registration packet. Fill out and return registration form (page 4) to registrar as noted at top of the form. Include page 5 and 6 if you are ordering banquet meal, box lunch, or bookstore items. View or print a full agenda. Remember to make your own hotel reservations! (see additional details below). Friday night picnic and annual Passenger Pigeon Awards ceremony. Saturday morning field trips to local hot spots including Dunnville Wildlife Area, Beaver Creek Reserve, and Augusta Wildlife Area. Saturday buffet lunch, annual business meeting and presentation session. Sunday/Monday field trips (additional cost for Sunday bus/railcar trip). Saturday evening social hour (cash bar) and plated banquet preceding the keynote address. You will need to purchase the banquet meal with advance registration. Meal tickets may not be available with walk-in registrations. Additional information on special opportunities! Steve Betchkal, award winning journalist and author, on “Soft Spot, Hard Sell: The Problem with Promoting Birds in the Media”. We have a soft spot for birds and believe their beauty enhances the quality of our lives. So why doesn’t everyone feel that same way? Steve will discuss his experiences with the monumental challenge of spreading the word on birds! This is a unique opportunity to experience "birding by rail" in the morning, with additional afternoon bus stops on the return to the Eau Claire area. The morning railcar adventure features an open-air train which will take passengers on a 5-mile ride deep into the Tiffany Bottoms Wildlife Area, part of the Lower Chippewa River Important Bird Area. Various stops are made along the way to explore the birds in different habitats including wetlands and floodplain prairies. The bus is a motor coach with bathroom, and there is a porta-potty available during the rail ride. Please be advised that the train ride is NOT handicap accessible. The $45 fee for this event covers the cost of the bus and the railcar trip. Hotel Rooms: Make your own reservations! WSO has arranged for special block rates at these two hotels. Special rate is good until April 23 or blocks are full. Mention the group name “WSO” when you make reservations. Rooms are reserved from Friday, May 24, through Sunday, May 26. You do NOT need to book all three nights for the special rate. Staybridge Suites, 1515 Bluestem Blvd, Altoona, WI (715-830-0800). Studio suites with Queen bed and pull-out sofa for $104.95 per night plus tax. About one block walk from River Prairie Center. Holiday Inn & Express, 12858 26th Ave, Chippewa Falls, WI (715-723-4654). King or double queen at $114.95 per night plus tax. About seven miles (15 minutes) from River Prairie Center. Contact Christine Reel, registrar, at convention@wsobirds.org or 262-844-8187. 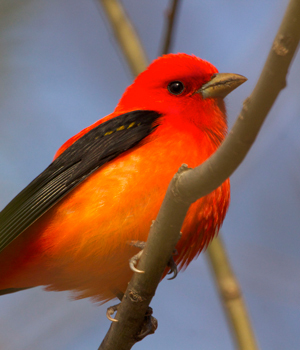 Join the AtlasConserve Wisconsin birds through our citizen science survey!